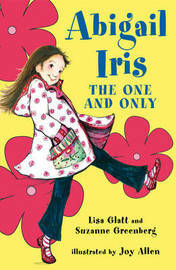 Readers of all kinds will fall in love with the precocious, adorable Abigail Iris! Abigail Iris is sick of being One-of-Many brothers and sisters, that is. She'd rather be an Only, like all her best friends, and not have to compete with siblings for time or attention. So Abigail is thrilled when she joins her friend Genevieve's family on a trip to San Francisco. She gets to stay in a fancy hotel, visit Chinatown, order room service and she doesn't have to share anything with her pesky older siblings! Amid all the fun, though, Abigail discovers that having a set of parents to yourself might be nice some of the time, it just isn't right for Abigail "all "of the time. An adorable story for Onlies and One-of-Many alike starring a one-of-a-kind new character!"